The Houston Rodeo 2020 dates are March 3–22, 2020. Typically, 3 or 4 of the performers are announced in late November or early December. We will have tickets to the concerts available as soon as those announcements are made and will be able to ship you the tickets in time for holiday gift giving. In previous years the full 2020 Houston Livestock Show and Rodeo Concert Schedule is usually announced on the second Monday in January (Jan 13, 2020). When is the Houston Rodeo? The 2020 Houston Rodeo will be held March 3–22, 2020. Where is the Houston Rodeo? The Houston Livestock Show and Rodeo takes place at NRG Stadium in Houston, Texas every March. The rodeo events are sanctioned by the Professional Rodeo Cowboys Association (PRCA)/ProRodeo and the Women’s Professional Rodeo Association and all participants are members of the ProRodeo or the WPRA. The HoustonRodeo is ranked as the world’s largest rodeo with over 1 million spectators each year. Unique to the Houston Rodeo, every day’s rodeo events are followed by the concerts featuring some of the biggest names in country, rock, hip hop and latin music. When the RodeoHouston™ events are completed a stage is moved to the center of the ring and rotates to provde all seats with a clear view of the artists. Previous year’s concerts have included acts such as Luke Bryan, Jason Aldean, Bruno Mars, Zac Brown Band, Blake Shelton, Lady Antebellum, The Band Perry, Martina McBride and ZZ Top. Who do you think will be on the 2020 HLSR concert schedule? When do Houston Livestock Rodeo tickets go on sale? We usually have tickets available for sale in September or October the year before the rodeo. They usually go on sale the second Saturday in January via Ticketmaster. Based upon previous history we expect Houston Rodeo Tickets will go on sale Saturday, January 11, 2020. This is usually the best way to get cheap tickets, but their selection is often limited because so many tickets to the Houston Rodeo concerts are sold as season tickets. Most of our tickets come from season ticket holders, so we generally have a better selection, including seats that often are never offered through Ticketmaster. 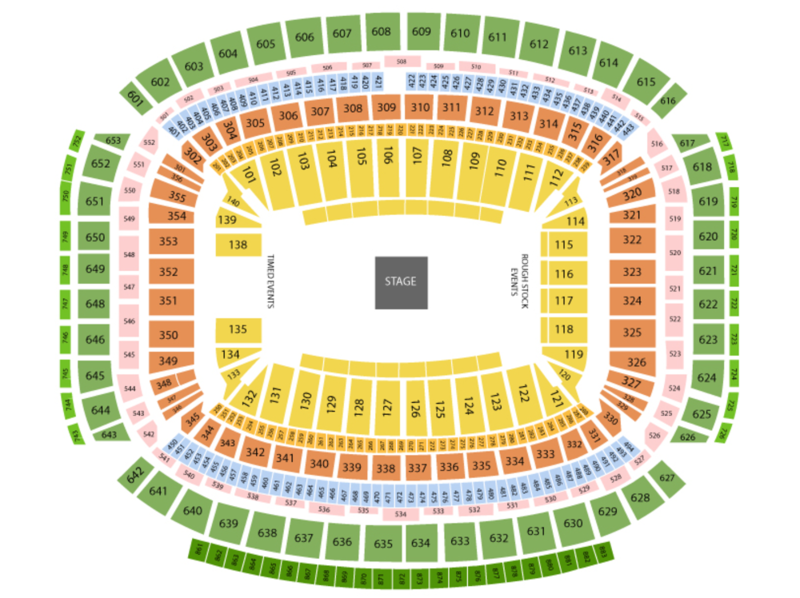 Where should I sit in NRG Stadium? Many people consider the Action Seats the best seats in the house. They are the first 7 rows in front of the center “sideline” sections and are numbered 1—7. Action Seats include complimentary snacks and (non-alcoholic) beverages and a cash bar is located nearby. These folding chairs are so close to the action that you shouldn’t be surprised if you get a little dirt on you when the riders or chuck wagon come charging by right in front of you. The Chute Seats are for the ultimate rodeo fan. Located directly behind the bucking chutes in sections 115—118 these tickets include a steak dinner before the action begins. Once the concert stage is set you have the option of staying in your seat or taking your collectible folding chair down to the dirt for the ultimate in close-up concert experiences. These lower level seats have a great view of all of the action and easy access to the main concourse where you will find plenty of concessions and restrooms. Rows are labeled A-Z then AA-JJ except there is no row I or II. The center sideline sections have Action Seats in front of row A. The Club Level has slightly wider and softer seats and includes access to Horseshoe Bar, Star Bar, Football Bar and the Spur Bar and you can even enjoy an upscale dining experience in the Club level if you like. Loge Level seats offer a more affordable seating option and include access to NRG Stadium’s concourses for concessions and clean restrooms. Eight awesomely wide video screens bring you close to the action from a dozen cameras throughout NRG Stadium. You won’t miss a thing! The most affordable seats in the house! The Upper Level seats include access to the stadium’s bars, restrooms and concessions located on the concourses. The eight huge video screens will make sure you don’t miss any of the action. What time does the Houston Stock Show start? Team One™ Tickets is a privately owned agency that buys and resells tickets on the secondary market. We are not Ticketmaster or the official Houston Livestock Show and Rodeo box office nor are we affiliated with the HLSR, RodeoHouston, or any rodeo team or venue. Our ticket prices reflect the cost of obtaining premium seating and are usually sold above "face value". You may be able to find “face value” tickets at the Houston Rodeo Box Office, but often the seating selection available there is not as appealing.